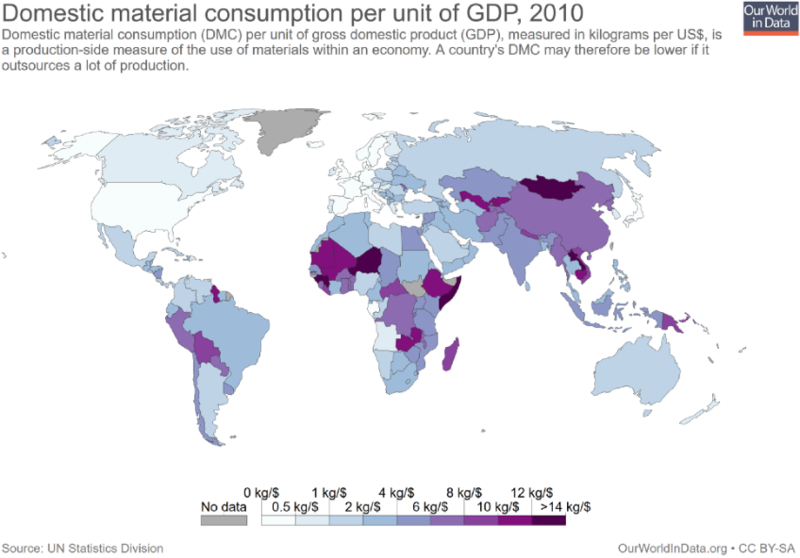 Sustainable Resource Use & Sustainable Development: A Contradiction?! This thematic map shows two variables; 1) coloration indicates reserve(green) − deficit(red)1 of national biocapacity and 2) area indicates absolute consumption of biocapacity. 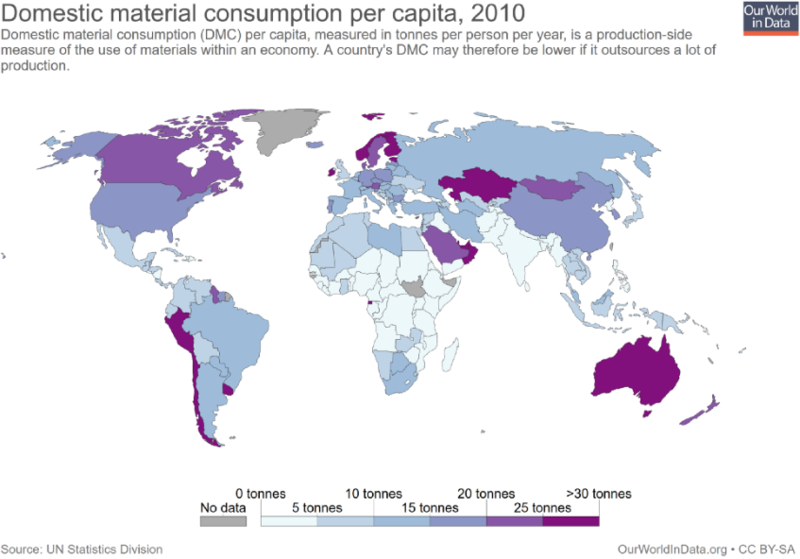 The area of each country has been distorted to represent its consumption i.e. 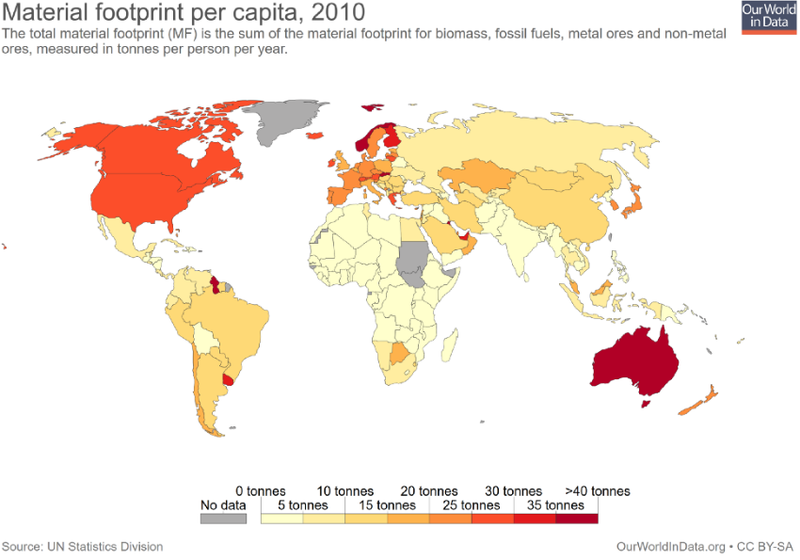 ; its ecological footprint. Countries which appear larger than normal are consuming more than their fair share2 and smaller countries are consuming less3. 1. Features with missing data are shown in blue, and are scaled as if they were in ecological balance. 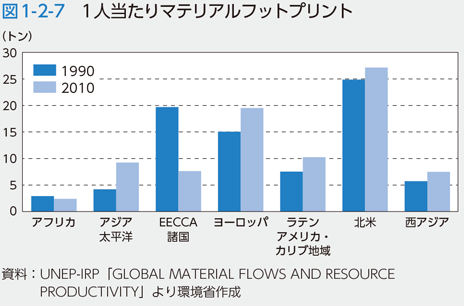 2. faire share; global biocapacity per capita, also known as "personal planetoid", currently 2.1 gha. Note that this does not take into account reserves for biodiversity. 3. The local "surplus" biocapacity of these nations is typically exported to support the deficits of other countries. Wackernagel, M., Schulz, N., et al. “Tracking the Ecological Overshoot of the Human Economy”, Proceedings of the National Academic Science. 9266-9271, 2002, p.99(14). 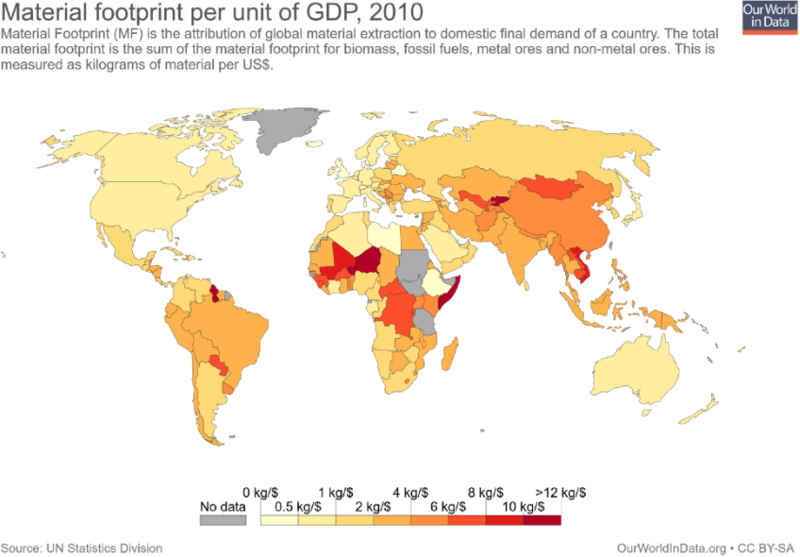 Ecological footprint (EF) analysis measures human demand on nature. 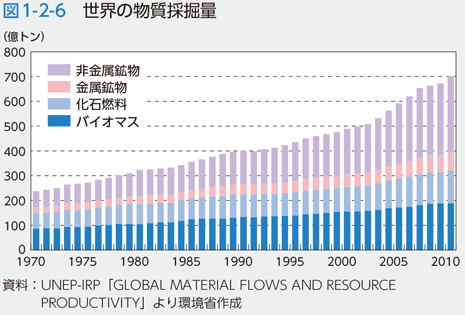 It compares human consumption of natural resources with planet Earth's ecological capacity to regenerate them. It is an estimate of the amount of biologically productive land and sea area needed to regenerate (if possible) the resources a human population consumes and to absorb and render harmless the corresponding waste, given prevailing technology and current understanding. Using this assessment, it is possible to estimate how many planet Earths it would take to support humanity if everybody lived a given lifestyle. While the measure is widely used, some also criticize the approach. Fig. 1. 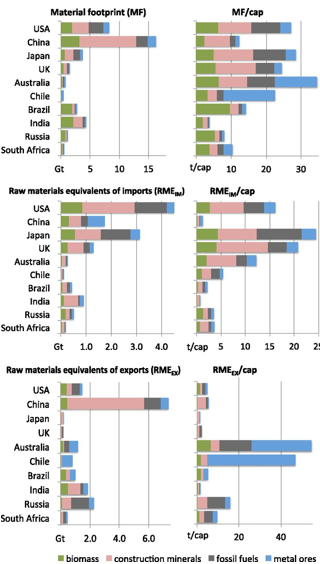 MF of national final demand and RMEs of imports (RMEIM) and exports (RMEEX) of selected countries in 2008 (totals and per capita). Fig. 2. MF/cap (by four categories) and DMC/cap (total) of selected countries and regions in 1990−2008(different scales for upper and lower rows, with the DMC/cap scale different for Chile only). Fig.3. Relative changes in total resource use (MF and DMC) and GDP-PPP-2005 between 1990 and 2008[values are plotted as ΔX = (Xt2 − Xt1)/Xt1; t1 = 1990].